Back in season 2010-11 the games were played in what was then known as North East Two. We won both games - at home 35-9 and at the Friarage by 22-8 on a cold January day. 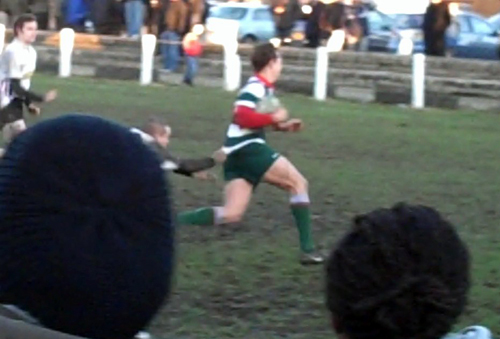 One of our tries that day (pictured) was scored by Scott Butcher – his touchdown in the corner securing the try bonus point which extended the lead at the top of the table. Butch may well be looking to repeat his feat as he is back in the squad after returning to training this week. He has now moved from the wing to the back row and scored in the big 51-27 opening day win against Novocastrians. We pulled off a much tougher 24-19 win at Westoe last week and are one of only three sides still with maximum points. Rovers had a good pre-season, and a decent win at home last week against Medicals, and will be keen to get their first way league win on the board. Of course, it’s also West v Rovers , a local and historic derby which is the envy of many rugby towns and where all the lads and supporters are anxious for local bragging rights. We are boosted by the return of some of the more experienced players who’ve been missing through injury and work commitments. The talented Gavin Painter has recovered from a knee injury, while 19-year-old Jake Linighan is available for the first time after being an almost ever present in his first season in adult rugby. Unfortunately, second row Joe Rafferty is unavailable but both No 8 Jay Corbett and prop Adam Brown who picked up nasty knocks at Westoe have been passed fit. West: Zac Southern, Will Hilditch, Gavin Painter, Peter Youll, Adam Peacock, Stu Waites, Ryan Painter (capt), Craig Hadwen, Andrew Rollins, Adam Brown, Jake Linighan, Chris Atkins, Alex Barker, Isaac Robinson, Jay Corbett. Changes: Adam Coates, Ben Armstrong, Scott Butcher. Looks like we are starting to have competition for places - good! Keep it going lads you've done great so far. Not going to be easy. But if we can defend like last week and keep our discipline I am sure we can prevail. GO WEST! Can't wait - should be a cracker.